With the Chinese new year in just a few days I thought that it was about time to practice my dumpling making skills. 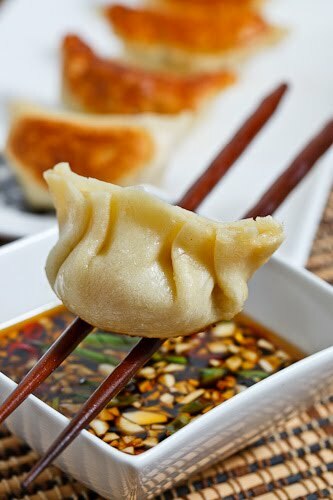 Jiaozi or Chinese dumplings, consist of a filling, generally a ground meat, that is wrapped in a thin wrapper and sealed by pressing the edges together or by crimping and they are commonly served with a dipping sauce. The dumplings can be cooked by frying them, steaming them or boiling them. Although steaming or boiling them is probably a little better for you, I prefer the fried version as the bottoms get nice and crispy and when they are fried they are often referred to as pot stickers. Dumplings are a popular New Years dish and since they are one of my favourite Chinese dishes it was the perfect excuse to make some at home. There are near limitless fillings that you can place in dumplings but I was dead set of including shrimp in mine. I made sure to cut the shrimp very coarsely because I wanted to get large pieces of juicy shrimp in the dumplings. From there I filled out the dumplings with some fairly common ingredients including pork, cabbage, bamboo, garlic, ginger, soy sauce and sesame oil. For the dipping sauce I decided to go with a simple soy and vinegar sauce that I spiced up with a bit of chili oil and a birds eye chilies. While I was investigating recipes I came across a recipe for Chinese dumplings on use real butter that included a recipe for making your own wrappers which I immediately decided to try. The dough was a little difficult to work with given that it was so dry but after adding a bit more water it worked out just fine. I was not very good at rolling the dough out into perfect circles but using a ramekin as an outline I was quickly able to trim them into nicer discs. Since I had already picked up some pre-made wrappers I made half with homemade and half with pre-made to compare them and I have to say that I definitely preferred the homemade version which were thicker chewier. One caveat with this recipe is that it takes a bit of time to wrap all of those dumplings so you need to plan for it. If you are also making the wrappers then it takes even longer but it is definitely worth it! Mix the flour and water in a food processor until incorporates. Cover the dough with a damp cloth while you let it rest for 30 minutes. Roll the dough into long cylinders about 1 1/2 inches thick and cut the cylinders into 1/2 inch pieces. Flatted the pieces with the palm of your hand forming discs and then rolled them out to about 2 inch diameter. Mix the pork, shrimp, cabbage, green onions, bamboo shoots, ginger, garlic, soy sauce, sesame oil, and cornstarch. Place a small spoonful of the filling in the center of the wrapper, fold the two sides over the center and pleat the edges to seal the filling in. Heat some oil in a large pan over medium-high heat, add the dumplings and fry until their bottoms are golden brown, about 2-3 minutes. Carefully add 1/2 cup of water, cover and steam until the water has disappeared, about 3-5 minutes. Uncover had cook for another 2 minutes over medium low heat. Place the dumplings on the well greased surface of the steamer, or on cabbage leaves and steam until cooked, about 6 minutes. Boil the dumplings until they float to the surface, about 3-5 minutes. Those cute dumplings look delicious! Love the sauce, and will use it with a veggie filling. those are really pretty. I think I will attempt to make those for my book club meeting but with veggies. Beautiful! Sounds like a dumpling making party is necessary. Mine NEVER turn out like this. Mine always look like a 2 year old attempted it. 2 year olds probably do better. I LOVE Chinese dumplings but I have to psych myself up to make them from scratch someday!! I bet the homemade dough was delicious! Absolutely lovely!!! Pls give me some! 😀 Thanks for sharing! Beautiful dumplings! You are very talented indeed. These look great! Definitely going on my to-do list. I have been livig in china for a year. I adore Jiaozi. The best ones are basic cabbage and pork. Another super good version, which is traditional of Nanjin is the ones willed up with soup. They freeze the soup, fill the dumplings with it and then steam them. The soup melts and they are amazing!!! Oh my boyfriend would love these! We always grab dumplings from Trader Joe's but I'm sure it's 100% better making your own. Thanks for sharing! You are quite the talented home chef! I love these little potstickers. And they look so perfect! I've been following your site for about a year now and I'm really impressed with your photos. They get better and better – great job! I have to say. wow. You are pretty good at this. 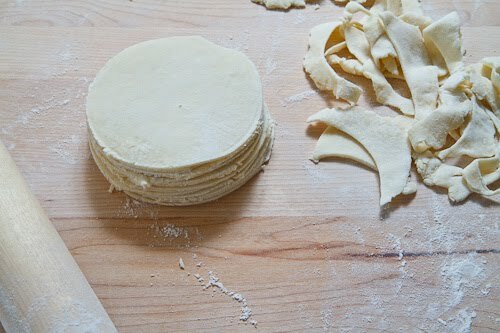 I have tried with pre made wrappers and they don't look a thing like these perfect dumpling! good job. Fun… I have looked at the home made wonton wrapper recipe but then decided to just buy them. Lazy I know. I love the filling and we are all addicted to bottled chili sauce it is nice to know that I can turn to you once we run out. You make your own dough. That's incredible! We usually buy them in the Chinese market. Great job! These made my mouth water! They look absolutely delicious! I am truly amazed at how much effort you put into these!! Homemade wrappers AND filling? Just amazing! They look gorgeous, too! Amazing, amazing post! gorgeous jiao zi– I know how hard these are to make, so great job! I love Jiaozi so thank you for this recipe. I'm making quite a few different recipes for Chinese New Year (one of which I've just posted on my blog) but I'm also now going to add this one to the list because they look and sound delicious! It's actually good to see someone else doing Chinese New Year recipes 🙂 because the other blogs I go to a lot haven't seemed to even realise that it is Chinese New Year this week. that looks wonderful Kelvin!! What a coincidence, I made some prawn dumplings too. but the soup form. Dumplings are one of my favorite foods and I am beyond impressed that you made your own dough. Good on you! Making dumplings is a labour of love for me. They're so time-consuming but the end result is always worth it! Wow, your dumplings look professional!! I make dumplings with my mom a lot, but mine never look as pretty as yours! nice wrapping of the jiaozi. So gorgeous and yummy!! I will be psyching myself up for a weekend to make them. Kudos to you for making your own wrappers. Your dumplings look incredible. Kevin these look perfect! If I didn't know any better, I'd say you were an Asian grandmother who'd been doing this for decades from the looks of them. Can you explain the salting and draining of the napa cabbage? These look professional. No one would have thought you had issues with wrappers. I've always loved dumplings the most when it comes to appetizers in Chinese restaurants. You're so right about that crispy bottom when they're fried. Do you think they would freeze before cooked? I do a lot of catering and freezing is a life saver! I have been making potstickers at home for years and the dough I use is three cups flour, i teaspoon salt and one cup BOILING water. Mix, knead a bit till smooth and then let rest 15 to 30 minutes while you make the filling. This dough is very easy to work, elastic and very delicious to eat. Even as noodles in lo mein. These look like they were served up at a high end Chinese restaurant Kevein .. gorgeous! My husband would definitely like the shrimp added in that fashion also. The dumplings look impressive, they look so perfect! Hi- Wow I just found your blog and your recipes look great, soo many vegetarian options which I love. I'll definitely be back! Hi these look so pretty! I made a sourdough variation for those looking for dumplings with a twist 😉 They don't look as pretty, but I'm happy enough haha! these look wonderful. will be trying them soon! Twin Tables: These jiaozi freeze really well. After you wrap them, place them on a baking sheet with space between them and let them chill for 30 minutes in the freezer. Then transfer them to their final storage destination such as a freezer bag. This will prevent them from sticking together and allow you to pull some out at a time. Anonymous: Sometimes cabbage can have a lot of liquid in it so you can throw the leaves into a colander, sprinkle with salt, let them sit for 20 minutes. Then rinse them, squeeze the liquid out and pat them dry. Wow, these pot stickers look great. 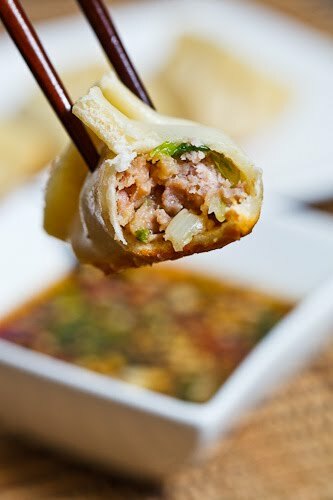 Props on making your own dumpling wrappers, it looks like they turned out fantastic. My husband's family learned to make this when his Grandpa was in the army many years ago. It's something that only the women in the family make, so the weekend after Thanksgiving they showed me how to make it. Theirs is a boiled pork dumpling and the recipe is all about the smell. We had to keep smelling the filling to decide if it needed more ginger, garlic, soy sauce, etc. A few weeks later I made it for my hubby all by myself and I got it spot on! There were so many that we froze a bunch on cookie sheets, then packed them in large ziplock bags for later use. I love your variation! Next time I will have to make some with shrimp and try frying them. Sounds great! Kudos on making your own wrappers – can just imagine how time consuming the whole process must be. But just look at how perfect your dumplings turned out! I'm from New Brunswick but grew up in Paris, Ontario. I happened on your site, via Cuisine Paradise. I like what I see and will return. Made some alterations; I didn't have shrimp so I used 400gm beef and added 2 tbs of fish sauce. Also added 3 green chillies, thai basil & cilantro. I boiled mine, and then dropped them in a lightly oiled pan to get them to crisp. Thanks again for making dinner fun and easy! This is probably a really dumb question, but do you cook the pork first? i really longing for such kind of recipe. thanking your for sharing it. Amy Brocato Pearson: No, the pork will cook when the dumplings are frying/steaming in the pan. The key to making a ton of dumplings with homemade wrappers is to invite friends and family over to eat and help. It's fun giving everyone a responsibility and allows you to chat and wrap at the same time! Great work! These look beautiful. We made these at the weekend at our Chinese friend's New Year celebratrion. They tasted amazing and we all had fun learning how to shape them propely. I had such fun. ! Thanks for sharing the dumpling recipes.I love Chinese dumpling very much! Diane: Glad you enjoyed them! Good tip about being careful when adding the water. I have updated the recipe to note that. 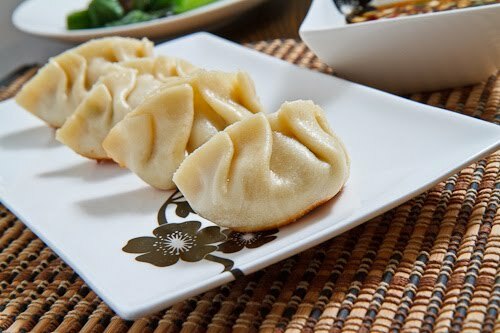 I've been looking for the best dumpling recipe and yours seem to be the top contender! Thanks for sharing and hope you can also share how to make the homemade wrapper. Great Jiaozi recipe Kevin! I never thought to add shrimp to the filling mixture (I must watch cholesterol). My only suggestion? Should you choose to fry them, use peanut oil. I think peanut oil adds a wonderful layer of flavor to the dumplings. These are on my cooking bucket list for this year! Yum! These look AMAZING but I'm wondering if you know a good substitute for shrimp in dumplings? I want to try making these but don't eat meat. thevegetarianginger: Load them up with more veggies like extra cabbage, shiitake mushrooms, carrots, bok choy, etc instead of the shrimp and pork. Where is the garlic in the garlic chili sauce ? If I leave out the shrimp should I double the pork? gwen: Yes that would do it. Enjoy!